Earlier this year, Travel Channel’s hit series, Food Paradise, came to Las Vegas and filmed at Bandito! Guests at Bandito that were part of the filming raved about the restaurant’s décor, hospitality, and of course food and drinks! 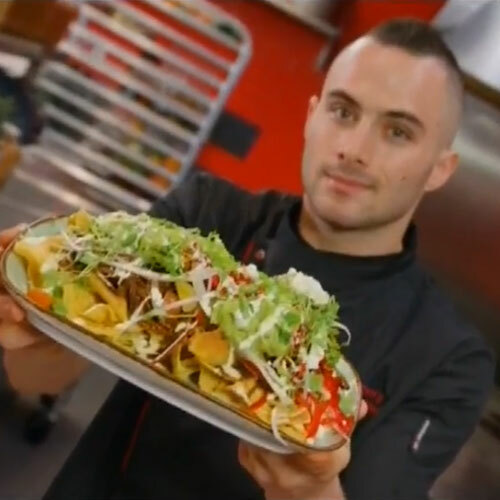 Bandito’s owner, Kent Harman along with Executive Chef Jordan Perry, were featured in the segment showcasing some of the best that Bandito has to offer. Included were some of the restaurant’s most popular dishes including its Habanero Shrimp and Carne Asada that comes served with a cheese and jalapeno tamale and house-roasted rainbow vegetables – essentially Bandito’s version of a surf-and-turf. Up next on the menu were the crispy, crunchy, ooey, gooey Barbacoa Nachos, Bandito’s take on Mexican BBQ. Tender pieces of braised and roasted beef brisket are piled high atop house-made chips, a three-cheese blend, black bean puree and a medley of fresh herbs and veggies. As the host said, it’s colorful, flavorful fun, Viva Las Vegas indeed!